Here are two short topics I want to share in blog form on how to keep chickens. 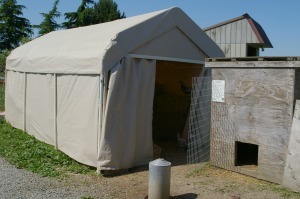 The first is a utility tent successfully used as a chicken coop. I came across it while traveling to a small dairy in the beautiful Skagit Valley of Washington State for a larger feature article on their farm. The farmers let me tour their goat dairy and chicken egg mini-farm. 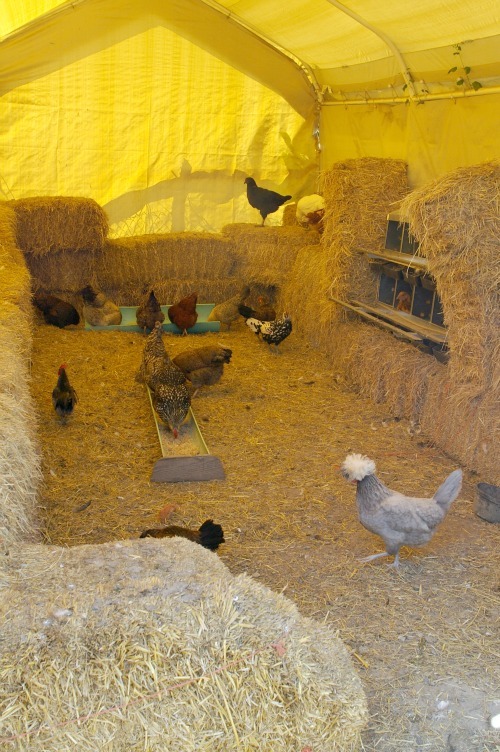 Below are shots of the inside and outside of this unusual set-up for their hens. They bought the tent on sale for only $75 (I think at Costco). Could be those cost more now. 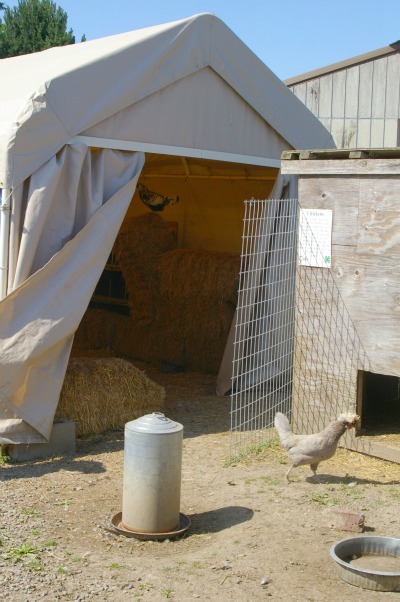 After choosing the location on their small plot of land for chicken housing, they set it up and did some extra wind-proofing with buried tie-downs. When keeping chickens, we learn they have particular needs such as nesting sites they return to over and over, and roosts they’ll automatically return to in the evening. If they do these things on their own, it can turn the topic of how to keep chickens closer to how to let chickens keep themselves. And with this coop set-up, the hens were very happy. You can see how they use straw bales to make roosts and nesting sites. The bales last a very long time. Once they become somewhat too soiled and aged, they’re removed for excellent compost and replaced with fresh ones. Although these microfarmers furnished extra wind protection, you can see the other buildings around the coop that also help cut back on wind. Also -- this was a real microfarm, less than an acre. Within that sub-acre, there’s an active family coming and going, plus pet dogs that hang out in the area day and night. So that keeps back the ground predators. Otherwise, this type of coop could be somewhat vulnerable to those wild ones that love chicken dinners. I’d like to elaborate a little here on the deep litter method I touched on in Micro Eco-Farming: Prospering from Backyard to Small Acreage in Partnership with the Earth. 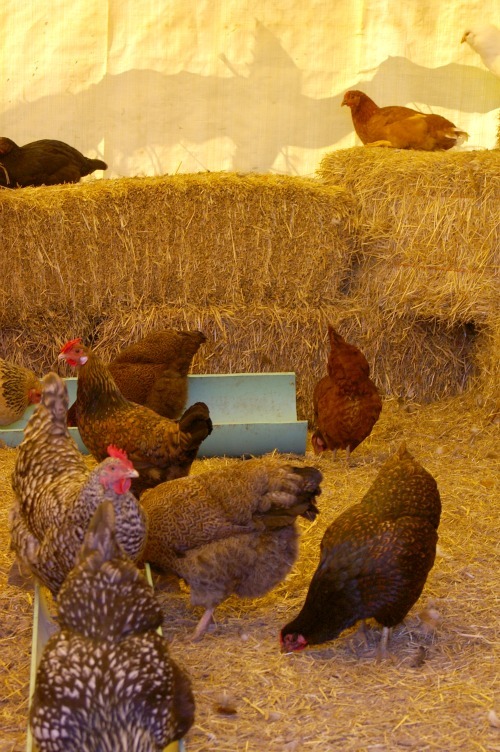 In many instances, the deep litter method for the stationery farm or backyard chicken coop is far superior to a bare floor with repeated cleanings -- or a system with pathogenic decomposition of waste. It helps keep chickens fed by virtually churning out perfect food for the birds, boosts their immune systems, is less work for the farmer, and eventually creates an excellent fertilizer. I originally discovered this method for chicken care in the very old classic, Handbook for Farm and Stable, and found it to be the best method for my own chickens. As described, it creates a situation that chickens thrive in (but other farm animals would not -- this method is like magic for chickens, but could be a disaster for ducks, a goats’ feet would rot and rabbits could die -- chickens have completely different food requirements and ground aeration abilities than other livestock. - The six inches to a foot of dry matter you initially build up in any good chicken coop can include old straw, old hay, dried land weeds, dried lake weeds, wood chips, grass clippings (dried as much as possible first), fall leaves, shredded non-inked paper (such as brown grocery bags), and add a pound or more of dried kelp for the trace elements you learned about in Chapter 4 of Micro Eco-Farming. Chickens will do a lot of shredding themselves, but if you want your dry material such as leaves initially chopped up even more and don't have a shredder, you can drive over them with a lawn mower with bag attached which shoots them right into the bag. You then carry it to the chicken coop. - Keep an eye on the deep litter as it decomposes under the manure from the chickens, which is very hot. If the litter begins to flatten out down to the earth level and becomes more manure than litter, add more litter to keep it built up. - Look for the deep litter to start becoming a living, decomposing, composting organism that absorbs manure rather quickly. At this point, only add more dry matter when manure seems to build up too much before disappearing. 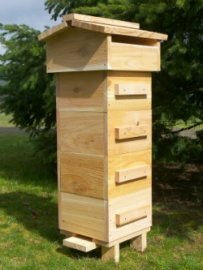 - Now, the deep decomposing bedding begins to feed the chickens with organisms living within the debris which include beneficial fungi, slugs, worms, pill bugs, earwigs and other insects, beneficial microbes and soil probiotics. - Further, when chicken coops have flooring that's deep and living, chickens' food supply is supplemented throughout the winter because the action of the decomposition makes the deep litter stay warmer in winter to help keep chickens fed and more comfortable. - Go ahead and toss the crushed oyster shell over the top of the litter. Other chicken foods such as kitchen scraps, fresh greens, sprouted grains, dropped orchard fruits, garden leftovers and so on can be tossed on top as well. These get the chickens scratching and add to the life of the deep litter organism itself. Just realize these are considered "wet" components as is the chicken manure, only not as hot. You don't want more wet than dry. So, watch closely to make sure your initial deep dry litter is in balance to create the living composting situation you want vs. a wet and messy chicken coop floor. If need be, you can add more dry matter anytime. - You can harvest the litter as compost once or twice a year, and start over. Because it will contain some relatively new manure when you harvest it, allow it to age before putting it on sensitive crops. Keep rubberbands away from chickens. Yeah, I know, why would anyone put rubberbands in with chickens. It can happen when people glean leftover veggies from grocery stores and food co-ops to feed their livestock. This is how my dad fed his chickens for years. Some veggies are held together with rubberbands. One of his hens kept getting thinner and thinner even though she was eating, and eventually died. When they cut her open, a rubberband was stuck in her crop. Didn’t kill her outright but slowly starved her -- food couldn’t properly grind and digest in the crop with that thing stuck in there.